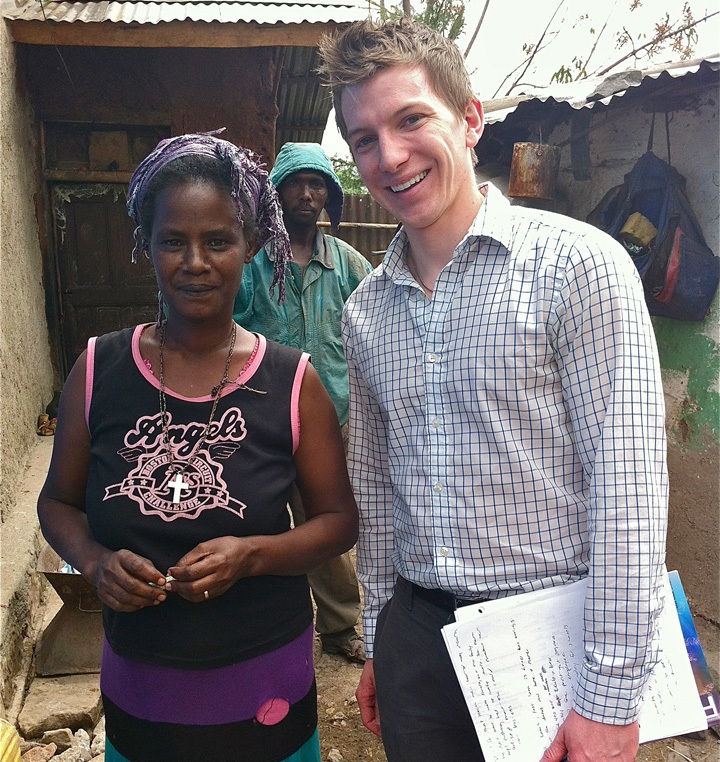 David Washer is a Bankers without Borders® volunteer who recently returned from a project in Ethiopia. Upon graduating from Yale University, Washer began his career in portfolio management at McKinsey & Company, where he currently works as a financial analyst. During his time at Yale, he was actively involved in human rights advocacy and research, and now looks forward to using his knowledge of finance and international development in the service of colleagues overseas. I’ve always had a healthy skepticism about short-term volunteer projects abroad. But as a Texas expatriate living in a Manhattan closet that passes for an apartment, I started to go a little stir-crazy as my heart for social justice from my undergraduate days began to beat again. The irony of it all? As an undergraduate, I had plenty of time – but no true, concrete skills to offer to development organizations. Once I began my work career, the opposite initially held true. 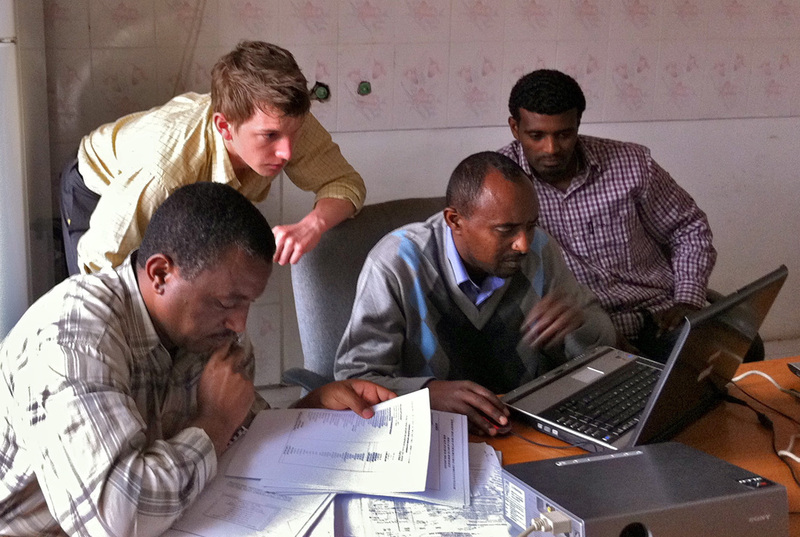 David Washer (center) spent a week meeting clients and lending his skills in finance to Eshet, an Ethiopian MFI, as part of BwB’s Financial Modeling Reserve Corps. I began to research and critically examine different service opportunities, and eventually came across Grameen Foundation’s Bankers without Borders (BwB) program. Convinced that through this program I could help empower others to lead sustainable, grassroots development in their own communities abroad, I decided to join. I was not disappointed. ‪Once I became a member of the Financial Modeling Blueprint Reserve Corps, BwB provided me with the training, templates and tools I needed to apply my financial analysis and modeling skills in a development context. Leo Tobias is Grameen Foundation’s Technology Program Manager of the Solutions for the Poorest Microsavings Initiative. Offering savings programs for the poor can be challenging. First, the microfinance institutions (MFIs) that want to offer these services are competing with a variety of alternatives, such as home-based savings (under mattresses, in strongboxes, etc. ), or keeping money with relatives or neighbors. Second, offering savings products fundamentally changes the relationship between the MFI and its customers. When clients only want loans, making that the primary purpose for their interactions with the MFI, there is a standard process. Taking voluntary customer deposits radically changes that relationship, to one that is initiated by the customer and that involves varying amounts of deposits or withdrawals. In other words, the customer interaction is less predictable. At any time of the day or night, the customer can ask for her balance and withdraw from it. A loan officer from CASHPOR in India processes loan payments on her mobile phone. Grameen Foundation’s Microsavings team has found that poor customers all want to have easy and convenient access to their funds. 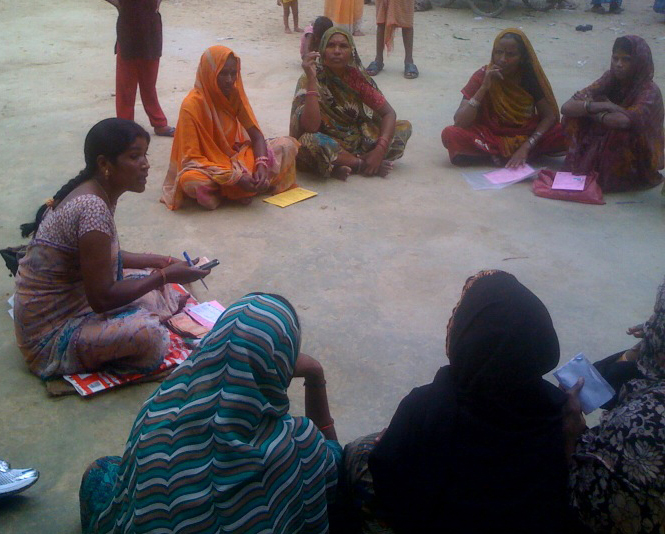 The MFIs we work with face common technology challenges involved with providing such access. In this post on the CGAP Technology Blog, Leo Tobias, our technology program manager for the Grameen Foundation Microsavings Initiative, discusses two of the major technology challenges facing MFIs.